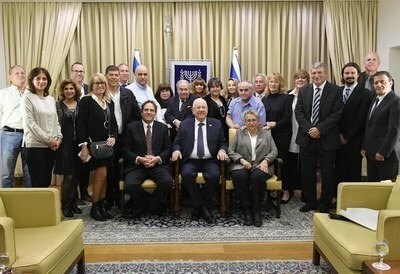 Synopsis : Israeli President, Reuven Rivlin, welcomed outstanding special education teachers and kindergarten teachers at a ceremony in Jerusalem. 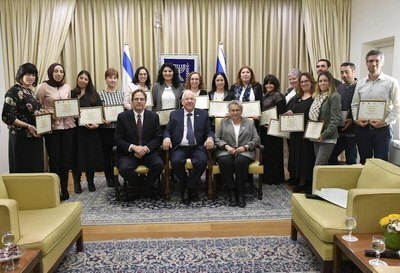 Israeli President, Reuven (Rubi) Rivlin, welcomed 16 outstanding special education teachers and kindergarten teachers at a ceremony at the President's Residence in Jerusalem, where the teachers were awarded certificates of excellence. The certificates were initiated and awarded by the Athena Fund, which empowers Israeli teachers, including special education teachers. The Athena Fund initiated and manages the iPad for Every Special Education Teacher program, through which, about 10,000 special education teachers in Israel will receive an iPad with 120 hours of professional training. The program is implemented in close partnership with the Israel Teachers Union, the Ministry of Education, Bank Massad, the Ted Arison Family Foundation and the Sylvan Adams Family Foundation. President of Israel Reuven (Rubi) Rivlin, First Lady Nechama Rivlin and the President and Founder of the Athena Fund, Uri Ben-Ari, with the Fund's directors and partners, at the ceremony awarding certificates of excellence to special education teachers and kindergarten teachers held at the President's Residence (Photo: Mark Neyman/GPO). "I believe that the basis for special education is recognizing the ability of all children to learn and their right to do so. It is society's obligation to see to it that this right is exercised. The people who are responsible for carrying out this important mission - those who put the "special" in special education - are the teachers who provide each child with an education to maximize his or her abilities. With your help, children who cope with a limitation, get to participate in a much better independent life," said the president. "Thanks to you, a more tolerant society has been created. I would like to thank you, on behalf of the citizens of Israel and myself, and to congratulate you on the first International Special Education Teacher's Day. You are certainly worthy of a day that celebrates your work." "We are pleased that outstanding special education teachers and kindergarten teachers are honored at the President's Residence. We will be happy to turn this event into an annual tradition at the President's Residence, which will also lead to public recognition of the many efforts that special education teachers and kindergarten teachers are making to promote students with special needs," said Uri Ben-Ari, President and Founder of the Athena Fund. "This is an exciting day for us, to receive such an honor and appreciation from the President of Israel for the teaching staff in Israel, in general, and for special education teachers in particular, who do a sacred job with a lot of love and dedication for the children," said Yafa Ben-David, secretary general of Israel Teachers Union. "The iPad has been proven to be a tool that enables excellent communication for these children and helps them a great deal. We hope that this day will become a tradition in the world of education, including special education." President of Israel Reuven (Rubi) Rivlin, First Lady Nechama Rivlin and the President and Founder of the Athena Fund, Uri Ben-Ari, with the special education teachers and kindergarten teachers who were awarded certificates of excellence at the ceremony held at the President's Residence (Photo: Mark Neyman/GPO). A professional committee of the Ministry of Education, together with district administrations and special education supervisors, selected 34 candidates (four from each district). A special committee of the Athena Fund, the Teachers Union and Bank Massad, together with professionals and other public figures, interviewed all the candidates and chose the 16 most outstanding teachers and kindergarten teachers to receive the award at the President's Residence. The iPad for Every Special Education Teacher program is designed to empower special education teachers and kindergarten teachers in Israel, and enable them to communicate better with their students. In addition, the program provides access to a wide variety of teaching materials, and significantly changes the lives of students. Teachers can prepare special programs for their students using the iPad, and students can continue the learning experience at home after school. Through this Athena Fund program, about 10,000 special education teachers in Israel will receive iPads, along with special software and applications for students with special needs and disabilities. Since the program's launch in November 2015, approximately 2,300 special education teachers and kindergarten teachers across Israel have already received iPads. The program is being implemented in cooperation with the Ministry of Education's Department of Special Education under the direction of Rachel Abramson, and the ministry's Information Technology Division, led by Roni Dayan. The "iPad for Every Special Education Teacher" program is one of Athena Fund's programs, along with the "Laptop Computer for Every Teacher in Israel", "Laptop Computer for Every Kindergarten Teacher", and "Tablet for Every Science Teacher" programs. Established in 2006, the Athena Fund is a nonprofit organization working to promote the empowerment of teachers in Israel by providing them with tools for self-fulfillment and professional advancement. The Athena Fund was founded by several prominent business leaders under the direction of President Uri Ben-Ari (CEO of UBA Ventures and former Executive VP of Ness Technologies). Its programs include Laptop Computer for Every Teacher in Israel (launched in 2007), Laptop Computer for Every Kindergarten Teacher (2012), Tablet for Every Science Teacher (2014), and iPad for Every Special Education Teacher (2015).